Plain Maxpure® creatine for the ultimate in convenience. Creatamax 300® (CR3) is a plain and very pure creatine Monohydrate supplement that is combined with a unique magnesium transport agent. CR3 has been designed to help you achieve your physique goals in record time. CR3 can be easily and effortlessly added to your energy drink, protein powder, meal replacement and weight gainer according to your training goals. 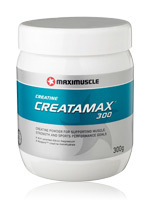 The beauty of Creatamax 300 is that it can boost the creatine content of other drinks without having to worry about the additional calories, dextrose or carbohydrates that exist in combination products such as Creatamax Extreme. Creatamax 300 will not affect flavour or taste when added to any other product in our range, giving you the control and creatine potency you need to achieve your training goals. Bodybuilders, Powerlifters, Strongmen: For muscle size and strength: Take 5g of Creatamax 300 daily mixed with your energy, protein or weight gain drink (Promax, Viper, Recovermax, Progain, Promax Meal, Promax Diet) 4 times a day for the first 5 days. Thereafter, take 5g morning and evening (or after training) mixed as above. Runners, Athletes, Cyclists: For endurance, stamina and energy: Do not take a loading dose. Instead, mix 2.5g with your preferred drink (above) in the morning and again after training (or in the afternoon).